Product #16196 | SKU CINSTUDMFT/HD/2 | 0.0 (no ratings yet) Thanks for your rating! The Blackmagic Studio Camera HD is a compact and lightweight broadcast camera designed for live production. Constructed from a magnesium alloy body, the camera is light even for travel, yet durable enough for use in the field. It has a large 10" LCD screen with detachable sunshade and an active Micro Four Thirds lens mount for compatibility with a wide range of lenses. The camera also provides features you'd expect to find in larger studio cameras, such as tally indicators, talkback, XLR audio connections, 3G-SDI inputs/outputs, and even optical fibre via an optional module. The camera offers 1080i and 1080p resolutions at frame rates of 23.98, 24, 25, 29.97, 30, 50, 59.94, and 60. It outputs 10-bit 4:2:2 video via its 3G-SDI output. For power, the camera has a built-in battery that lasts up to 4 hours on a single charge. The camera can also provides a standard 4-pin XLR power input for external power sources. The internal battery provides the added benefit of being able to hot swap external batteries without having to power off or interrupt recording. The camera control buttons have been placed right below the viewfinder, letting you easily make adjustments without taking your eyes off your subject. The camera can also be controlled via ATEM switchers with a future update. The update will be available as a free download for both the camera and the ATEM switchers, and will send camera control commands down the SDI programme feed to the camera to control focus, iris, gain, and more straight from any ATEM production switcher. 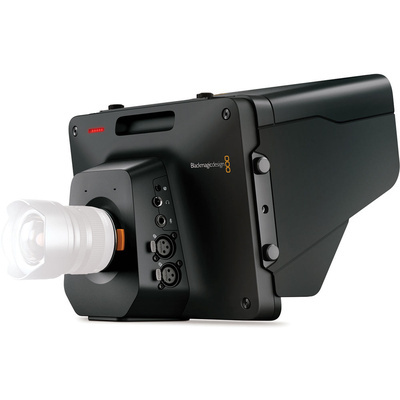 The Blackmagic Studio Camera features a compact magnesium allow chassis that is both lightweight and strong, making it well suited for use in the studio or in the field. The camera body features a rubberised coating that gives extra grip when changing lenses. It's lightweight and compact size makes it easy to transport and be used in tight spaces. For easy operation, all of the most important control buttons are placed right below the LCD screen, letting you make adjustments without having to scroll through complicated menus. You can instantly turn on overlays, adjust focus and iris settings, activate talkback, and even select return programme video. Connections are grouped on both sides of the camera with video in and out (3G-SDI and optical fibre) and power on side, and XLR audio inputs, headphones, and LANC on the other. This lets you quickly setup and change cables as needed, while keeping them out of the way and protected during your production. With the addition of an optional and user-upgradeable optical fibre module, you can use standard, low cost fibre optic cable to connect the camera to a switcher over large distances, even at the largest outdoor venues. The optical fibre connection is bi-directional and carries HD or Ultra HD video with embedded audio, talkback, tally, and even camera remote control. The Blackmagic Studio Camera supports the tally SDI standard used on the ATEM range of live production switchers. This means that tally from the switcher is broadcast to all cameras from all video outputs of the ATEM switcher and it's sent to the camera via the programme video connection. Tally lights illuminate automatically when your camera is live, and will stay illuminated during multiple cameras transitions. With a light on the front for talent, and a light above the viewfinder for the operator, cast and crew can easily see which cameras are on air. View programme video from your live production switcher at the press of a button. Simply press the camera's PGM button and the viewfinder will display the programme video feed from your switcher, turning the viewfinder into a large SDI monitor. You can even use the programme SDI input to view playback from a local HyperDeck recorder when using the Blackmagic Studio Camera for recording. A variety of mounting points lets you customise your rig to suit your product needs. The Blackmagic Studio Camera includes two 3/8"-16 mounting points on the bottom, and ten 1/4"-20 mounting points on the side and the top. This update, which will be available as a free download for both the ATEM switchers and Blackmagic Studio Camera, allows for control of the camera from any ATEM production switcher. It works by sending the camera control commands down the SDI programme feed to the camera and lets you adjust focus, iris, gain, and more. Blackmagic has also taken the primary colour corrector from DaVinci Resolve and built it into the camera, which can be controlled from the ATEM switcher. This means you can control a full primary colour corrector from the camera itself, letting you do more creative corrections than simple colour balancing.